Western blot analysis of extracts from A-431 and 3T3 cells, untreated (-) or Forskolin #3828-treated (10 μM, 15 min; +), using Phospho-VASP (Ser157) (D1C8O) Rabbit mAb (upper) or VASP (9A2) Rabbit mAb #3132 (lower). Immunoprecipitation of Phospho-VASP (Ser157) from A-431 cell extracts treated with Forskolin #3828 (10 μM, 15 min). Lane 1 is 10% input, lane 2 is Rabbit (DA1E) mAb IgG XP® Isotype Control #3900, and lane 3 is Phospho-VASP (Ser157) (D1C8O) Rabbit mAb. 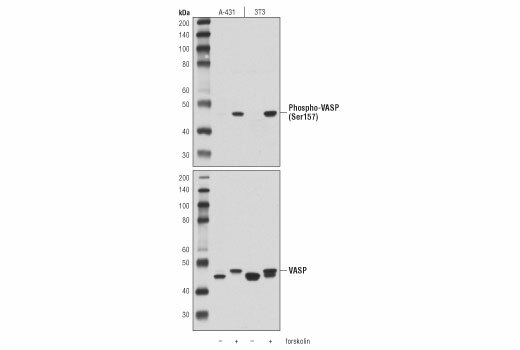 Western blot analysis was performed using Phospho-VASP (Ser157) (D1C8O) Rabbit mAb. A light chain-specific secondary antibody was used. 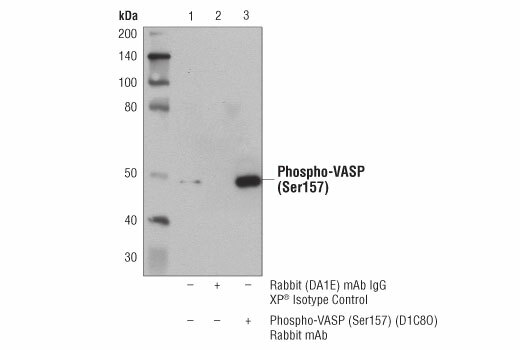 Phospho-VASP (Ser157) Rabbit mAb recognizes endogenous levels of VASP protein only when phosphorylated at Ser157. Monoclonal antibody is produced by immunizing animals with a synthetic phosphopeptide corresponding to residues surrounding Ser157 of human VASP protein.